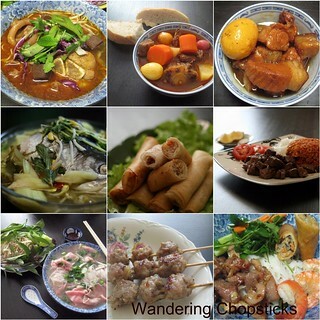 All text and photos Copyright © 2006-2012 by Wandering Chopsticks. All rights reserved. You may not copy my photos or text without my permission. You may not use my content for commercial purposes. If you wish to reprint any part of this blog, you must observe the following Copyright and Attribution Requirements. Thank you! Oops - I commented that I'd like to see a recipe index with categories and here it is... sorry for my error! I love to try out your recipes! I'm new in Vietnamese cuisine and your site is so vast of recipes that I don;t know which one to start first! If I allow myself to choose, I could feed a battalion of foodies :-D I guessed problems I will face are the ingredients... hope I could find a good supplier for it. Thank you for sharing... really appreciated your efforts. I was wondring if you going to come out with your own cooking book and tips of cooking authentic Vietnamese cuisine.